I was working on a project where I had to find out all the registered filters that I was about to apply, so here’s a WordPress quickie for you! I found this out by inspecting the apply_filters function inside the plugin.php core file, and apparently there’s a $wp_filter global that contains them all in an associative array where keys are tags. So by doing a print_r at a certain time in your theme or function, you’re able to find out the whole list, but you might as well filter to the hook that you’re looking for. As an example let’s take “comment_text” as the filter tag and list all it’s callbacks — i.e. let’s find out what filters are applied to the comment text before we print it out. Note that this has to run at a point where the filters have already been added, probably before a call to the comment_text() function. If you’re wondering what the array keys are in the array that you’ve printed, those are the priorities which were passed (or defaulted) when calling add_filter. I hope this turns out to be useful to somebody, so thanks for retweeting! I was looking into more premium themes for WordPress the other day, and I see that most of them simply love to give users different page templates. Not all of them are doing it the correct way, but it still is a value add to a WordPress theme. If you recall from the Codex pages, Page Templates in WordPress are defined with a special comment header in the template files. They can then be chosen at the Edit Page screen from within the WordPress admin area and the chosen template will be used instead of the standard page.php (or other fallback). So today I was playing around with that, and thought that it’d be nice if page templates actually showed the way they look before I’m applying them, at least schematically. So I fired up my image editor and came up with this screenshot (on the right). Of course you can simply select a page template and then hit the preview button before publishing, and that works most of the times, but what if there are ten or twenty page templates defined by the theme? The template names I’ve seen aren’t too descriptive, then again, there isn’t much space there for that, so an extra description field would definitely be cool. A schematic representation would clearly show what the template looks like, if it has got any sidebars on the right, top, bottom? Or maybe an icon representing a specific logic behind the template. A grid of blocks for “Portfolio Page” for example. I actually ran a short experiment and found a great function called get_page_templates (thank you @nacin!) 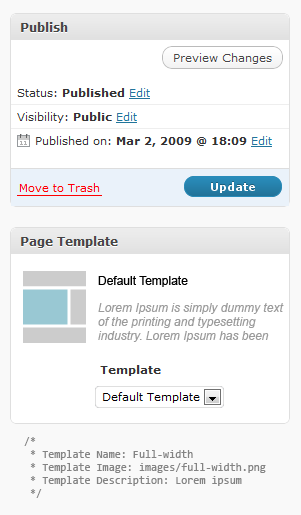 which returns an array of the available page templates associated with the currently running theme. Below is the draft code that I came up with, it basically lists all the page templates available together with the URLs to their images. Description can be added same way. Right, do we need to? I know that you, my friends, are more techy than just WordPress users, but think about the normal people for a second. Would this be an easier way to access and work with Page Templates in WordPress? Or does this just make it even more complicated than it already is? Thank you for your input and retweets! For the tech people I’ll explain what I’m trying to do here. So first of all we don’t want to shorten links on draft posts as that could be a waste of resources, so we return an empty string. The magic with get_post_meta and add_post meta in the middle and at the end of the function are done for caching purposes — we don’t want to send too many requests to the Google API so let’s keep the already shortened links in the post’s custom fields. This may be annoying in the UI so you might want to add an underscore in the meta key (“_googl_shortlink”) which will make it invisible to the UI. Next up, I retrieve the permalink of the published post, since we don’t want to shorten an already shortened URL which is that ugly one by WordPress. I use that permalink in an HTTP request to Google’s API using WordPress’ WP_Http object. Note that I’ve added the Content-Type header, which is required by Google, otherwise it’ll return an error. I decode the result body using json_decode (you need PHP 5.2 or later to do this) and if there’s a valid id, which is the shortened URL, I save it to the post’s meta and return the shortlink. If something went wrong, I return the original WordPress’ short URL. Right, you might want to see your short links’ analytics at some point. Well, Goo.gl shortened links are all public and their analytics are public too, so all you have to do is browse to goo.gl/info/code where code is the 5-6 alphanumeric digits attached to your shortened URL at the end. I wrote about custom columns in a post called Custom Post Types in WordPress 3.0, which should give you a general idea of what’s going on here. For more details visit the WordPress Codex. That’s about it! Yeah, I know there’s some stuff that can be improved here, like smooth error handling, but it’s up to you to implement it. For more info check out the Google URL Shortener Getting Started page. A good place for experiments with Google’s APIs is Google APIs Console. Following the Lead Generation Forms with WordPress and SugarCRM post, I came across the need to assign the generated lead to some person in the CRM. It would be easy if you could do it by simply using usernames in the system, but unfortunately usernames may change, but user IDs do not. User IDs in SugarCRM are stored in a 36-byte alphanumeric string with symbols, which is easy to capture from the database, but not very usable that way. I worked a little more on the snippet I gave before and came up with a new function called getUserId, where a search is performed based on the username. So $result will contain an array where you’ll find the alphanumeric ID of the person with the username “john”. I believe there was some other method for doing that in SugarCRM version prior to 5.5.2 CE, but the new SOAP Web Services are mostly based on a few general methods – get_entry, get_entry_list, set_entry, etc, which are applicable to basically any module including Users. Now your newly created leads will be assigned to your user, which is quite convenient when you have e-mail notifications turned on during assignment. Hope that helped somebody! Cheers, and thanks for sharing! I’ve modified the snippet a little bit due to comments below, and thank you again Alex (@Viper007Bond) for clarifying things with the WordPress HTTP API and those very useful Transients. I actually grabbed some ideas from Alex’s own version of the Twitter Followers Count for WordPress snippet and added a fail-safe route (for times when the Twitter API is down). Yup, quite simple isn’t it? Now call my_followers_count whenever you need to retrieve your followers count ;) Hope this will be of use to someone ;) Cheers!